Its read-only optical drive is capable of reading Blu-ray Discs at speeds of up to three times that of its predecessor. The console features a hardware on-the-fly zlib decompression module. 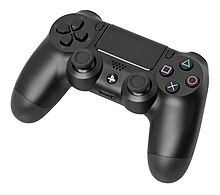 The original PS4 model can output in 4K and play multimedia in the format, but does not play games in 4K. The console includes a 500 gigabyte hard drive for additional storage, which can be upgraded by the user. System Software 4.50, which was released on March 9, 2017, enabled the use of external USB hard drives up to 8 TB for additional storage. 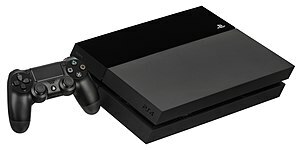 PlayStation 4 games are distributed at retail on Blu-ray Disc, and digitally as downloads through the PlayStation Store. Games are not region-locked, so games purchased in one region can be played on consoles in all regions, and players can sign-on to any PS4 console to access their entire digital game library. All PlayStation 4 games must be installed to the console's storage. Additionally a system called "PlayGo" allows users to be begin to play portions of a game (such as opening levels) once the installation or download reaches a specific point, while the remainder of the game is downloaded or installed in the background. Updates to games and system software are also downloaded in the background and while in standby. PS4 users will, in the future, be able to browse games and stream games via Gaikai to demo them almost instantaneously. Sony says it is committed to releasing an ever-increasing number of free-to-play games, including PlanetSide 2 and War Thunder. Sony also took steps to make it easier for independent game developers to release games for the PS4 by giving them the option to self-publish their own games rather than rely upon others to distribute their games. Emulated versions of selected PS2 games are available for purchase via PlayStation Store, which are upscaled to high definition and have support for PS4 social features. Selected PS3 games are available for streaming via the paid service PlayStation Now. ^ a b c Nutt, Christian (April 24, 2013). "Inside the PlayStation 4 with Mark Cerny". Gamasutra. p. 3. Archived from the original on May 10, 2013. This page was last edited on 25 April 2019, at 12:37 (UTC).